This sign was apparently spotted in Japanese retail chain Momotaro, and it does an interesting job of explaining why the store doesn't have many Xbox 360 games. The poster reads, "Teacher! Why are there so few new Xbox items at Momotaro? 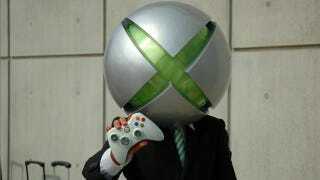 Is Xbox not popular?" Below that in green, it reads, "That's not the case! We often sell new items! But the number of shoppers is small..."
"Teacher, why don't you stock a lot?" reads the new question in blue. The answer is a series of green dots below that. Then, the shop explains that it cannot order large numbers of items because the number Xbox 360 owners is low. However—and this part is pretty neat—the shop explains that it's recommended to purchase by reserving titles, and the shop will even search through its branches across the country to find the Xbox 360 game you want. That's pretty cool! While people online in Japan seem to think this poster is pretty cruel, I don't. The whole ad, which looks to be a humorous parody of Great Teacher Onizuka, does a playful job of explaining why it doesn't carry lots of Xbox 360 titles.